The New Jacobin Club has been an active participant and veteran of the underground punk/metal/performance art/sideshow scene for over 15 years. That’s 15 years of struggle as one of Canada’s most controversial and, for the most of those years INDEPENDENT, acts. We’ve had relationships with a couple big distributors through our own label as well as a stint with an American record company. You can still purchase our last 2 albums at Amazon, buy our digital releases on iTunes, etc. You know what? We finally noticed something after all this time that really pissed us off. But – we want you to have all this stuff. So we’re doing something a little psychotic to take on Amazon and iTunes. See all that colourful and wicked looking packaging above? 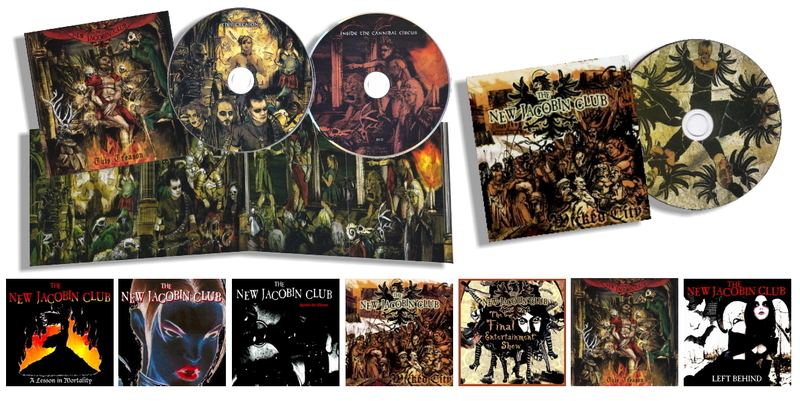 What you’re seeing is 2 cd’s with bonus tracks, “Inside the Cannibal Circus” dvd, and a COMPLETE DIGITAL BOX SET with every official NJC studio release including non-album bonus tracks – and you can get it all for $29 plus a reasonable flat shipping rate good for anywhere in the world. Take that, middle man. Click here to order now!! This is an EXCLUSIVE one-time Thank You offer only for people who have already picked up a digital copy of one of our albums! Just hit the ORDER NOW button below to add to your purchase and get both “This Treason” and “Wicked City” discs along with “Inside the Cannibal Circus” on dvd delivered right to your door plus the NJC Digital Box Set for just $29 plus shipping! Remember – This is an EXCLUSIVE offer ONLY for our fans that have purchased directly from us online! No thanks, I’ll pass on this upgrade and instead proceed to the download page for the album I have already purchased.